An exquisite display of wedding elegance. 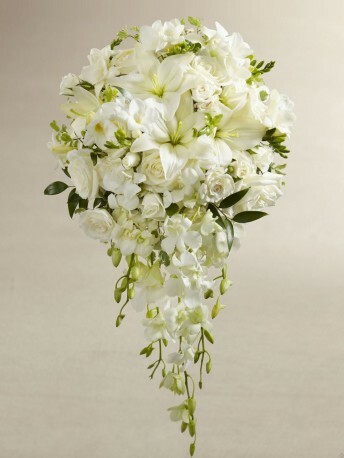 This incredible array of white blooms, including, dendrobium orchids, roses, asiatic lilies, freesia, spray roses, and mini hydrangea are offset by beautiful lush greens and arranged in a cascade fashion to create a truly stunning bouquet that will complete your bridal look with its sweet sophistication. Approx. 24"H x 12"W.